Hurricane Season Takes Its Toll On Home Sales And Builder Optimism The recent enormous storms have hit the industry hard, with several signs turning negative. But economists expect a rebound when the weather improves. 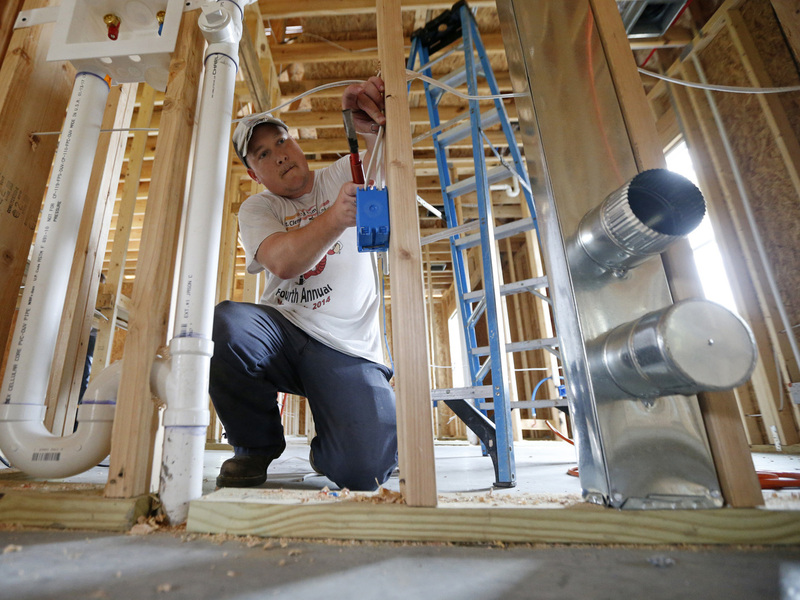 Electrician Chris Piazza works on a home being built in Destrehan, La., in March. The recent enormous storms have hit the housing industry hard, with several signs turning negative. With Hurricane Maria still smashing up Puerto Rico, the economic costs of this year's hurricane season continue to grow by the minute. It will take a while for economists to tally it all up. But this much already is clear: The recent enormous storms have taken a toll on the housing industry. Three separate industry reports, issued over the past three days, have all shown that rough weather in the South and wildfires in the West have been creating problems for this key economic sector. On Wednesday, the National Association of Realtors said existing-home sales fell again, down 1.7 percent from July. The decline reflected the ongoing lack of inventory — that is, buyers can't find enough affordable houses to purchase. But it also showed the impact of Hurricane Harvey, which kept many people from getting to their closings. "Some of the South region's decline in closings can be attributed to the devastation Hurricane Harvey caused to the greater Houston area," Lawrence Yun, chief economist for the National Association of Realtors, said in a statement. "Sales will be impacted the rest of the year in Houston, as well as in the most severely affected areas in Florida from Hurricane Irma." The Realtors' data followed Tuesday's Commerce Department report showing that its measure of housing completions fell 10.2 percent in August from the previous month. And in the South, where Hurricane Harvey hit hard in late August, completions were down 22.2 percent. When weather prevents builders from completing projects on time, it hurts profits. And on Monday, the National Association of Home Builders said its monthly industry survey showed a significant decline in optimism. The trade group's confidence index dropped to a reading of 64, down 3 points from August, because "the recent hurricanes have intensified our members' concerns about the availability of labor and the cost of building materials," Granger MacDonald, the group's chairman, said in a statement. Still, economists are optimistic about the longer-term outlook for housing because many other factors remain favorable. "With ongoing job creation, economic growth and rising consumer confidence, we should see the housing market continue to recover at a gradual, steady pace throughout the rest of the year," National Association of Home Builders Chief Economist Robert Dietz said. Yun agreed that better days will come once the hurricane season ends, saying "nearly all of the lost activity will likely show up in 2018." And there's one other factor that brightens the outlook: Millennials are getting older, paying off student debt and moving into their homebuying years, which is expected to drive demand. At the end of its meeting Wednesday, the Federal Reserve Board issued a statement on the economy, and it too said that while the hurricanes have been hurting businesses and workers, the impact won't last. "Storm-related disruptions and rebuilding will affect economic activity in the near term, but past experience suggests that the storms are unlikely to materially alter the course of the national economy over the medium term," the board said.